(Todd) Schebor, president of Schebor Landscaping Services, and (Jack) Baker, an employee, were working at the Kugler Mill Square Apartments on Beech Street in Bond Hill at 2 p.m. on June 25 when (eight-year-old Natasha Stuckey) nearly drowned. ...(The) two men were mowing the front lawn...when a crowd of adults and children gathered and began to scream for help at the pool...(Schebor) hurried to the water and found a lifeless Natasha. She had bluish skin and wasn't breathing. Schebor ran to call 911. He returned and within seconds began to perform the Heimlich maneuver...On the third try, vomit and water completely cleared from the girl's airway, and she started breathing again. She regained consciousness immediately. Paramedics arrived, administered oxygen and took her to the hospital. She was released the next day - fully recovered. In a previous item, I discussed a variety of questions regarding Eckberg's column and a July 16, 1993 CBS This Morning feature by medical correspondent Howard Torman MD. Recent e-mails I exchanged with Natasha Stuckey - now 27 and still living in Cincinnati - and her father, Tyronne "Ty" Stuckey, only raised more questions. Before getting to those, the fundamental problem with the Enquirer column and the CBS feature is that they appear to be the only media coverage of the events that supposedly took place 19 years ago today. That is, it appears there weren't any straight news reports about this very dramatic, unquestionably newsworthy drowning rescue and subsequent hospitalization. If there were no news reports, where did Eckberg and CBS obtain the information? Read both stories and you'll see that landscapers Todd Schebor and Jack Baker are the only sources of the information about the event. Missing from both is any original source verification that Natasha Stuckey did, in fact, receive medical care. There's also no indication in either story that any medical personnel - EMTs, attending physicians, nurses - or a hospital spokesperson were contacted. What about records for Schebor's 911 call, the ambulance run sheet, and a likely police report? Nothing about those either. 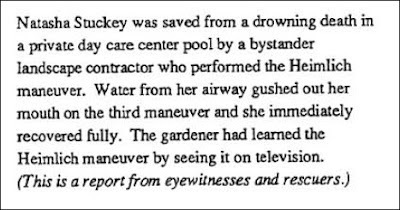 Per the following unedited correspondence, I provided Natasha Stuckey and her father the opportunity to provide minimal documentation that would quickly verify that the near-drowning and subsequent events occurred. I didn't receive a reply from her father. I am Natasha Stuckey that nearly drowned 20 years ago, and had been saved by your father's technique. I will need for you to remove my name off of your webiste [sic]. I was in shock to run across this on your website, I take this matter very seriously. This has opened a new wound for me. I couldn't comprehend why such a minor notation would elicit such an anxious response, especially almost two decades after the fact. Why the "shock" and the demand to remove her name from my site? Plus her life was saved by the Heimlich, right? Wouldn't she want to share the good news? Naturally I was curious, so I responded straightaway. Thanks for your e-mail and I'd be happy to discuss this with you. Before moving forward, however, I need to verify you are who you say you are. I have no reason to doubt you, but at the moment all I have from you is a Yahoo e-mail address. Thanks for your understanding and I look forward to your reply. I am the girl that nearly drowned in July 1993. The landscapers that removed me from the pool that summer administered the Hemlich [sic] which cleared my lungs. I woke up in Jewish Hospital and then had been moved to Children's for observation. Last night I just happened to google [sic] my name and came across your website. I was shocked when I looked at the website, and did go through a variety of the articles that had been linked to it. I have always dodged publicity from the incident because this is still a fresh open wound. I am not comfortable about this situation at all, and I do not discuss this with anyone. My family knows because I was 8 at the time and this was almost 20 years ago. Sorry, I don't understand. Why would you be uncomfortable? This was a tough situation, and I am still sensitive about pools and being around water. Even after taking multiple swim lessons, I have not been able to get into the pool comfortably. This made me reflect on that incident and find my article from the Cincinnati Enquirer from July 18, 1993. I understand your purpose for trying to prove your cause. Yet, I am not substantial support. I do exist, this situation did happen and the Heimlich Manuever [sic] did save my life. I do not want to be associated with your claim for medical fraud, and want to be removed from the site. I do not want my name linked to this at all. Even if she's "sensitive about pools and being around water," why should she care if I or anyone else was interested in the case? I don't welcome being told what I may or may not write about. Nevertheless, if she had a legitimate psychological problem as a result of being rescued from drowning almost 20 years ago, I had no desire to contribute to that. I'll seriously consider removing your name from my website after you provide me with letters from representatives of Jewish and Children's Hospitals confirming the dates you were hospitalized. If she was acting in good faith, why should she have a problem with that? Turns out that was a big problem for her. I will not give you my personal information. Especially when the Cincinnati Enquirer has it documented. Your site has false claims, using my name. My lawyer will be in touch with you. Simply obtaining confirmation of the dates is "personal information"? And why would any of this compel her to play the lawyer card? I haven't asked you for any personal information, just verification from the hospitals of your dates of hospitalization. In any event, I'm planning to report about your case on my blog next week, so if you wish to add anything else or to discuss further before then, please let me know. By the way, were you aware that your case was reported by CBS network news? You asked for my hospital release records, there are HIPAA laws against that. I have asked you to remove my name off of your website. I do not need to be mentioned on any blog, website or new story. I never talk to reporters and do not need to be in the news. I wanted to be civilized and email you about this. This situation did not "allegedly" happen. My "case" needs not to be discussed. You have no facts, only "suspicions". My lawyer will be in touch, you are violating my civil rights, which are not protected by the first amendment. I'm not sure where she got that information about HIPAA (and about the First Amendment), but I hope she didn't pay her attorney for it. Therefore the decision to withhold verification of the dates of her hospitalization belongs to Ms. Stuckey. The next week, as I informed her, I posted my first item in this series. For a follow-up, I had questions for Natasha's father, Tyronne "Ty" Stuckey, a prominent Cincinnati businessman, spoken word poet, and philanthropist who lends his time to a variety of nonprofits. 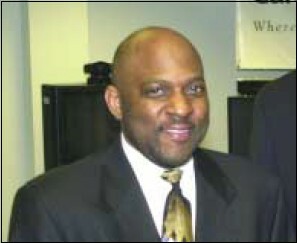 For example, according to Lori Fovel, Communications Director at the Cincinnati chapter of the American Heart Association, since 2002 he's been on the board of that organization. Peter, my concern it [sic] that of my daughter. You have open up [sic] old wounds in her life. She told me she wanted no part or association with what you are doing on that website and or blog. Peter, she ask you and I am asking that you remove her name from any current or actions or plans you have with your website or blog. I do expect an answer as to which actions you plan to take. I've decided to make you an offer that I've never made before. In an unsolicited e-mail I received last week from Natasha about the reported near-drowning from June 25, 1993, she wrote, "I woke up in Jewish Hospital and then had been moved to Children's (Hospital) for observation." All you need do is to arrange for representatives of those two hospitals to mail me letters confirming the dates she was a patient. I'm not asking for any personal or medical information - just confirmation of the dates of her stay. Immediately upon receiving the letters, I'll delete Natasha's name from my website, delete my blog item from yesterday, and I'll never write about or discuss the case again. I also promise to immediately destroy the letters from the hospitals and to never disclose the contents. Based on the paternal sentiment expressed in your e-mail, presumably you'll jump at this opportunity. In any event, please let me know by end of the day Monday, June 11, if you accept my offer so I may know how to proceed. I haven't received a reply, but my offer's still on the table.